Do dung beetles really eat elephant dung for breakfast, lunch and dinner? Elephant dung is their favourite, but they can use all kinds of dung for food – even human. Dung beetles have an incredible ability to smell dung and can locate it up to 80m away. They like it fresh (it has to be moist) and you may find 100 to 200 beetles on a dung pat at a time. They break it down within hours and tap it into perfectly round balls that become compacted as they’re rolled. There’s fierce competition for balls and they are often hijacked. The successful beetles bury them in soft soil under bushes and feed on them there. For brood balls, they prefer buffalo dung because of the finer, more pliable texture. The female rolls the brood ball backwards, gripping it with her hind legs, and the male follows her in hot pursuit. Mating takes place underground and one egg is laid in each ball. 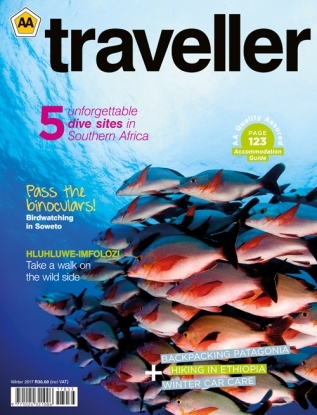 Why can’t the Addo dung beetle fly? This species, the Addo flightless dung beetle (Circellium bacchus), is the only dung beetle without wings. It evolved like that because of the strong winds and dense thicket in the area. However, it still has the vestiges of wings. What makes the Addo flightless dung beetle special? Once it was widespread, but now it only occurs in pockets in the Eastern Cape and has been declared vulnerable and at risk of becoming extinct. Addo Elephant National Park has the biggest population. 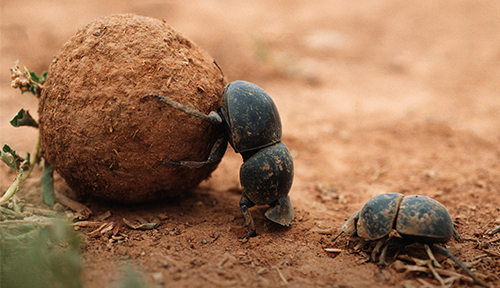 It’s one of the largest dung beetles – not just in Africa, but in the world – and its dung balls are about the size of golf balls. What threats does this beetle face? Getting squashed! Elephants use the roads and deposit dung there. We’ve had to educate the public not to drive over the beetles or the dung pats, as there can be hundreds of beetles busy under the crust. We have also had to change the way we camber the roads so the beetles and their dung balls will roll off them and not get stuck in ditches. Habitat loss is also a very serious issue. How does the ecosystem benefit from dung beetles? The beetles improve soil quality and help restore vegetation through their composting activities. This boosts the spekboom thicket that grows in Addo. It is one of the most productive types of veld in the world and it has a high carrying capacity (the number of animals it can sustain), making for a successful elephant population. For the thicket to survive, you need all the microsystems in place. In turn, beetles won’t bury their dung balls in open areas; they want secluded, shady areas. Why didn’t I see any dung beetles in the park today? It needs to be around 22°C and have moisture in the soil for them to come out. Today was a little dry and cool. Mid-morning and the middle of the afternoon after rain are normally the best times to see them.